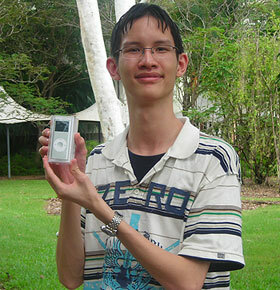 First-year business student Louis Ho is the winner of CDU’s Orientation Day iPod. Louis won the draw for an iPod for students who agreed to take part in a survey on Orientation Day. He will specialise in marketing in his bachelor of business degree. The 18-year-old says he is looking forward to catching up with old friends from school while at university, and in making new friends. ‘CDU also offers scholarships that motivate us to complete our degrees,’ he says. He currently works as a casual at Red Rooster, but is now devoting most of his remaining hours to study. With his studies now under way, Louis says he is not looking much beyond successfully completely his course and that he likes to ‘go with the flow’. ‘But I also want to be able to look at the way the working environment is changing,’ he says. When not studying Louis like to play table tennis, soccer and to ‘hang out with friends’. He is already impressed by the friendly atmosphere at CDU and has discovered that the Chinese garden is a great place for creative contemplation – and that it adds to the multicultural atmosphere of the Casuarina campus. Louis was among the hundreds of students who took part in CDU’s Orientation Day, which this year was the most successful on record. Check out the Orientation 2007 photo gallery.